H. F. Glen is a LibraryThing Author, an author who lists their personal library on LibraryThing. See H. F. Glen's author page. 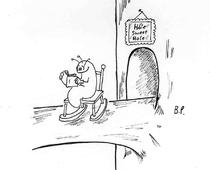 About meTHE PICTURE: Shows the Bookworm demonstrating the meaning of 'hospitus', from SAPPI What's in a Name. Picture (c) Bernice Porter (member Taliska). About my libraryBotany books belong to both wife and self. Zoology guides are mostly daughter's. Cookery books belong to the whole family. Lace books are Better Half's. Books tagged Collecting are mine. Art and English language are (mostly) inherited from a deceased aunt.